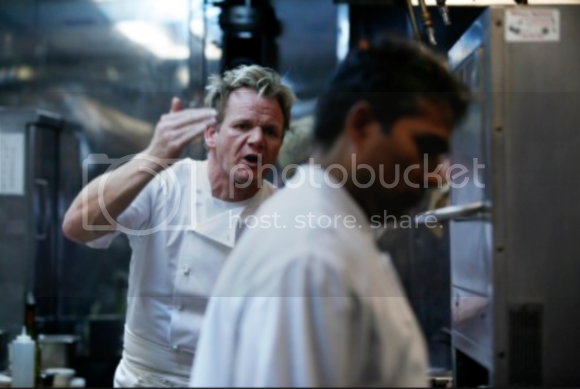 After a nominally friendly greeting at the outset, chef and reality show magnate Gordon Ramsay gets right to the berating. His method is very United States Marine Corps boot camp style: break 'em down, then break 'em down some more. And maybe we'll have something to work with (by the end of the episode). 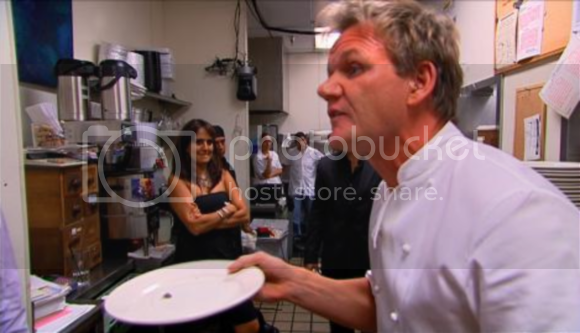 When the restaurant owner / manager / chef inevitably doesn't absorb what Gordon is laying down, it's time for some serious exasperating. 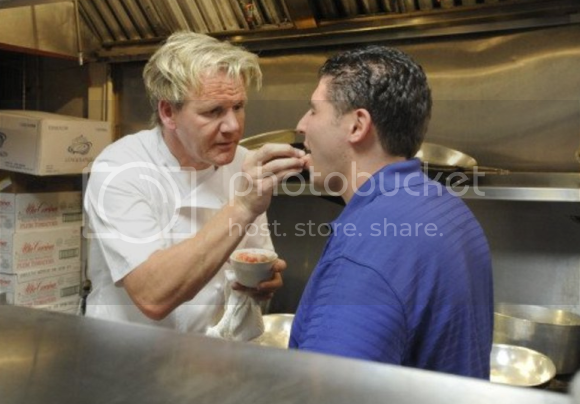 This will involve a special grab bag that Ramsay will go back to again and again. Look for key phrases like "It's rawwww" or "This isn't fit for a dog's dinner!" or "If you're not going to try / care / give a [bleep], you might as well hang it up, mate." When El Capitan has the restaurant owners and staff nice and shaken up, it's time to take it to the next level: kitchen and storage area inspection. Usually what he finds would be things that they would never even dream of daring people to eat on an episode of Fear Factor. And just when things seem darkest and past the point of any sort of hope, wham-o. We get a new restaurant design, a menu overhaul, an attitude reboot, and a spirit of unyielding enthusiasm and unity…. at least for a little while. Posted on: Saturday, March 9, 2013	by Eric - TV Geek Army "Revered Leader"
Posted on: Sunday, November 4, 2012	by Eric - TV Geek Army "Revered Leader"
Posted on: Monday, February 14, 2011	by Eric - TV Geek Army "Revered Leader"
Posted on: Monday, February 7, 2011	by Eric - TV Geek Army "Revered Leader"
Posted on: Sunday, January 30, 2011	by Eric - TV Geek Army "Revered Leader"
Posted on: Sunday, January 23, 2011	by Eric - TV Geek Army "Revered Leader"
Posted on: Sunday, May 16, 2010	by Eric - TV Geek Army "Revered Leader"
Posted on: Thursday, April 15, 2010	by Eric - TV Geek Army "Revered Leader"
Gordan Ramsay revisits two restaurants, which allows for lots of time eaten up with flashback footage.